If Banks Aren’t Serving the Poor, Who Is? 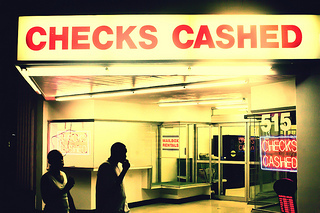 Over the past few months I’ve written short pieces on my work as a teller at a check cashing store in the South Bronx in Public Books, The Atlantic, and the New Yorker. I posted the links to these pieces on the community development banking listserv and was delighted when a deep conversation ensued both on the listserv and in the comments sections of the publications. Policy makers, banking officials, people who run credit unions, consumer advocates, and those who work in the alternative financial services (AFS) industry all took part, generating over 100 posts on top of those generated on the publications’ websites. The posts and comments ranged widely and have informed my research as I have continued my work. Shelterforce also took note of the conversation, and asked me to blog about it. I am writing here about some of the main themes from this conversation. In several instances, those who wrote in discussed the practices in their own institutions. I have not verified these practices. Others, both consumers and field professionals wrote about learning on the ground, as I did, why so many low-income people choose to use alternative financial services. The approach I used in my research, to spend a great deal of time working at check cashers and payday lenders, resonated with many readers. Quite a few respondents work for or with credit unions, many of which have clearly struggled with the issues of how best to meet the needs of customers who are not well served by banks. Hank Hubbard, president of Communicating Arts Credit Union in Detroit, wrote that products such as courtesy pay fees, which CACU offers, “keep me up at night.” Henry Wirz CEO of SAFE credit union in North Highlands, Calif., wrote that his credit union tries “very hard to outcompete the fringe banking operations . . . We have better prices and we offer financial counseling and financial advice that we do not offer. . . But most of the time we are not successful in moving the unbanked to our way of doing things.” For the record, I have not yet done specific research with credit unions, but will begin to fill that gap over the next several months. After reading my work, a couple of respondents seem to be asking the same questions I find myself asking. Richard Keller, a planner and financial educator based in Amherst, Mass. asks: “To what extent does the growth of fringe financial services correlate with the increasing preponderance of low-wage jobs and the high rate of real un- (and under-) employment?” It appears that the high use of alternative financial services may stem from the fact that an increasing number of Americans are living paycheck to paycheck. They have no ability to save, build assets, even pay for regular monthly expenses. When unexpected expenses arise—car repairs, medical bills—they have no way to pay for them. In other words, perhaps we should shift our focus from the suppliers of these services to the conditions that have created such great demand for them. Perhaps the most heated part of the conversation concerned payday loans, which is particularly interesting given that I didn’t really write about this aspect of the AFS industry. Payday lending is illegal in New York state, where I had worked. I have since worked as both a lender and a collections agent at Check Center, a check casher/payday lender in Oakland, Calif., and will be writing about that experience soon. Stay tuned! Lisa J. Servon is Professor and former dean at Milano School of International Affairs, Management, and Urban Policy.